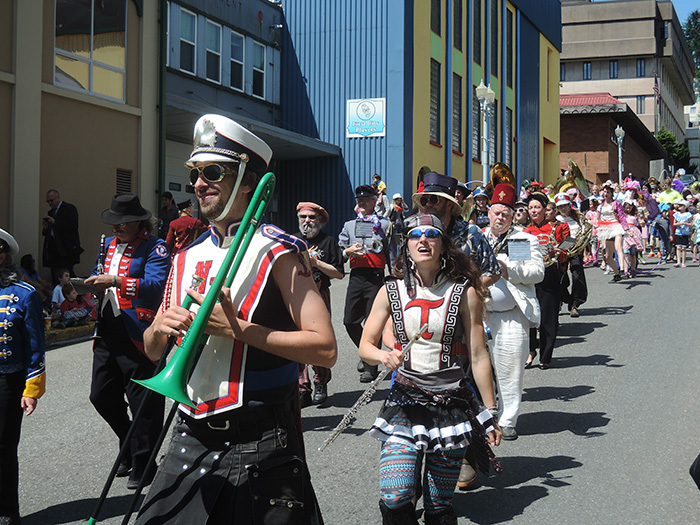 In every town the New Old Time Chautauqua visits, locals experience celebratory parades through right through the center of town, led by a 30-piece marching band, and showcasing jugglers, stilt-walkers, magicians, dancers, and character artists. These fun, family-friendly public events are an opportunity to celebrate community, sharing music, merriment, and laughter. In addition to performers and musicians, each parade stars local community groups, including gymnastics teams, 4H horse clubs, local drummers, puppets, and veteran’s color guards. Local musicians are sent music ahead of time and invited to join the band, and each parade culminates in an exciting, free-to-the-public sneak-peak preview show with up to 4 variety acts from the big main stage show. The New Old Time Chautauqua’s parades truly bring communities together. And are free, all-inclusive events for young and old alike.